Pomeranians are spirited, energetic dogs. Today’s tiny Pomeranian is descended from an ancient line of powerful working dogs that pulled sleds and herded livestock. Pomeranians are bursting with energy, as though Australian shepherds are packed into the Poms' tiny frames. Though Pomeranians require no special diet, owners must take care to ensure these little dogs are getting all the nutrition they need. Many dog food companies use grain and plant matter as filler in their foods. But dogs are carnivores, and the Pomeranian’s tiny stomach cannot properly digest foods with a lot of filler and still extract the protein the dog needs. 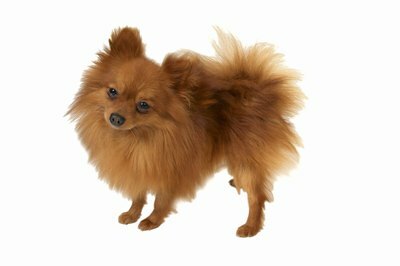 Pomeranians who don’t get enough protein may become underweight and malnourished. If you are buying commercial canned food, it should have little to no filler. You can feed your dog small amounts of boiled chicken or liver. Puppies’ meat should be cooked, as puppies' stomachs are not developed enough to digest raw food. Unfortunately, tooth loss is common in the Pomeranian breed. Prevent it by providing dry dog food, which will keep the Pom’s teeth and gums healthy. Unless your dog has a tendency to overeat, dry dog food should be available at all times. The dry dog food you choose should have small pieces easy for tiny mouths to chew. Larger pieces are a choking hazard for the diminutive Pomeranian. Pay close attention, as the Pomeranian has a tendency to overindulge in things it really likes, just as people do. A tiny dog has a tiny stomach, so you can easily give your Pomeranians too many treats. Spicy or salty snacks could upset the dog’s digestion. Pomeranians should never get people food. Even a minuscule amount of something like chocolate, which is toxic to all dogs, could call for an emergency trip to the veterinarian. You can give your Pomeranian commercial dog treats with no filler, as occasional treats or for positive reinforcement in training. Sometimes it may seem like your Pomeranian is just being picky when really the dog is allergic to something in the food. If your dog is vomiting, licking her paws or rubbing her nose on the carpet, she may be suffering from allergic reaction. All Pomeranians are delicate, especially so-called “teacup” Poms, who weigh less than 3 pounds. No official designation of teacup Pomeranian exists; breeders may call a pup a “teacup” if it was the runt of the litter, has health problems that limit growth, or was born of two such pups that have teacup traits. Is it Bad to Shave Pomeranians?